Weeds and puddles are the only things filling one of the parking lots these days at Wonderland Park in Revere. The racetrack has been shuttered for six years. The 38-acre property, just down Route 1A from the Suffolk Downs racetrack, holds enormous economic potential and is considered a cornerstone of this city’s revitalization. Yet six years after closing, the dog track languishes, with little sign that better days are ahead. Revere has a long gambling tradition, and developers in recent years have eyed Wonderland and Suffolk Downs as potential casino sites. But Mayor Brian M. Arrigo, a staunch opponent of a proposed slot parlor near Suffolk Downs, believes the city’s future no longer is tied to gambling. Arrigo spent substantial political capital to defeat the slots parlor proposal in a local, nonbinding referendum last month and scored a resounding victory when voters rejected the proposal by a 2-to-1 ratio. On Tuesday, a statewide referendum calling for the slots parlor in Revere was soundly defeated. The ballot measures drew attention to the future of Suffolk Downs and, to a lesser degree, of Wonderland, less than 2 miles away. Suffolk lost its bid for a resort casino license two years ago. Wonderland’s owners, CBW Lending of New York, include three of the principal owners of Suffolk Downs. Arrigo describes the Wonderland property as the key to a city renaissance. Just steps from a Blue Line stop and its seven-level parking garage, it is also a short walk to Revere Beach. Around the corner, hundreds of high-end apartments are under construction. Recent high-end developments such as Assembly Row in Somerville and Station Landing in Medford have shown how the right project can spur broader growth, Arrigo said. But city officials are frustrated that the property continues to lie vacant, eight years after voters approved a ban on dog racing. Saplings sprout from the building’s sagging roof, and seagulls float in enormous puddles on a guano-caked parking lot. Arrigo swept into office in January on a pledge to force progress on the neglected property. When the owners ignored him, Arrigo went to court to obtain a warrant that allowed a platoon of city inspectors inside the building for the first time in years. They documented more than 100 violations, from damaged structural elements and collapsed ceilings to electrical systems in disrepair. During the February visit, the building’s caretaker told the inspectors it was too dangerous for them to go to the second floor, advice the team heeded. The city could have fined the owners thousands of dollars a day, but Arrigo accepted their assurance of a quick demolition, which is expected to cost several million dollars because of the high cost of material disposal. In a statement, the company, which includes Coastal Development, a New York firm headed by developer Richard Fields; concessionaire Joe O’Donnell; and Vornado Realty Trust, said it was working with the city to demolish the building. Neighbors to the property, however, want to see progress. Jeremiah Rop, who lives with his family near the fringe of the property, said the site has been an eyesore for far too long. “We want a better neighbor,” he said. John Powers, the city councilor for the neighborhood, said that “if ever a building needed to come down, it’s that one,” but he did not fault the city for not imposing fines on the owners. “You can fine those people all day long, but you also want to have their cooperation on future development,” he said. Arrigo said he has drawn “a line in the sand” — if the building is not demolished by the beginning of next year, he will insist on substantial fines. Wonderland opened in 1935 and was successful for decades. It peaked in the 1980s, when daily wagering topped $1 million and many considered it the country’s premier dog track. After it closed, city leaders sought to bring gambling back. In 2013, Revere Mayor Dan Rizzo signed an agreement to support a casino at Suffolk Downs in exchange for a promise from the developers for $15 million in annual contributions to the city. 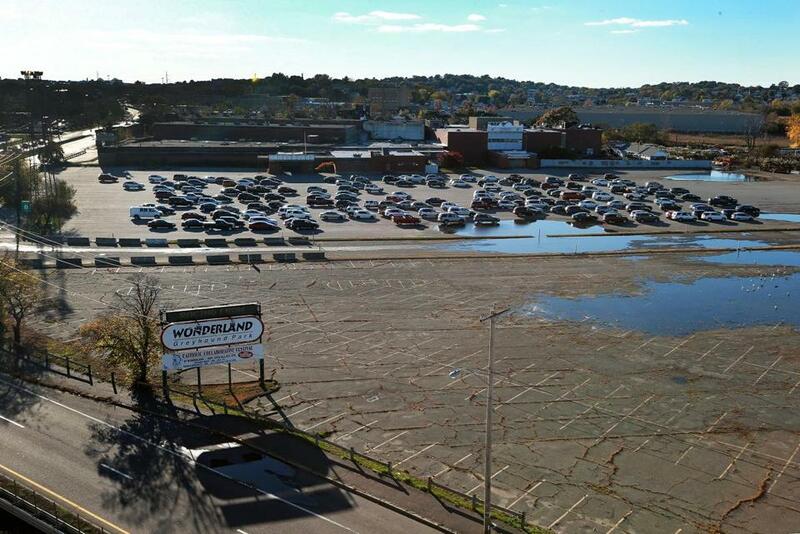 When East Boston residents voted against the casino at Suffolk Downs, which straddles the border between Boston and Revere, the developers moved the plan to the Revere side, where voters backed the plan by a healthy margin. A year later, the state Gaming Commission awarded the Greater Boston resort casino license to a rival developer, Wynn Resorts, which is now building a $2.1 billion casino on the banks of the Mystic River in Everett. At the time, many in Revere said the lost casino would be a devastating blow. But Arrigo, then a city councilor, struck a forward-looking note.